Even though the North Vietnamese didn’t have much of an air force at the start of the air war over Vietnam in 1964, with Soviet assistance they were soon able to present US pilots with a few surprises. Their MiG-17 fighters were old-fashioned and only had guns as their armament. The jets were small, though, and well-suited to out-turn heavier US jets mostly optimised for higher speeds. Peter Dornbach has built the more modern MiG-21, known as the “Fishbed” in the West. This entered Vietnamese service in 1966. Peter’s model has a retractable undercarriage, opening cockpit and a brick-built representation of the characteristic camouflage used by the Vietnam People’s Air Force. With its higher speed and two AA-2 Atoll air-to-air missiles the Fishbed was typically used in hit-and-run attacks. The US countered this threat using the F-4 Phantom II. This wasn’t particularly agile, but had powerful twin engines. Its crews were taught to use these as an advantage against the MiGs by manoeuvring in the vertical. The particular example built by Evan Melick is “Showtime-100”, a US Navy F-4J flown by Randy “Duke” Cunningham and William Driscoll who put this tactic to practice shooting down three Vietnamese fighters during a famous mission in May of 1972. Added to their two previous victories, this made them the US Navy’s first and only aces of the Vietnam war. 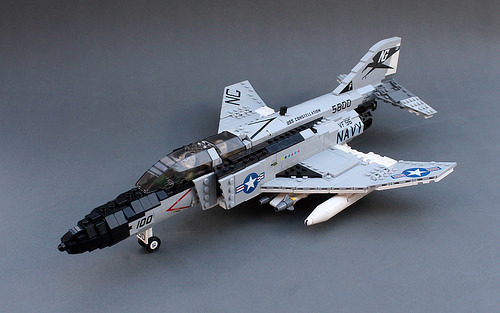 Like most US Navy aircraft from the time period, it had distinctive squadron markings, which Evan recreated on his model using a mix of brick-built patterns, custom vinyl stickers and water-slide decals intended for 1/48 scale models. Note his clever use of new 45 degree angled tiles to build studless leading edges on the jet’s wings. 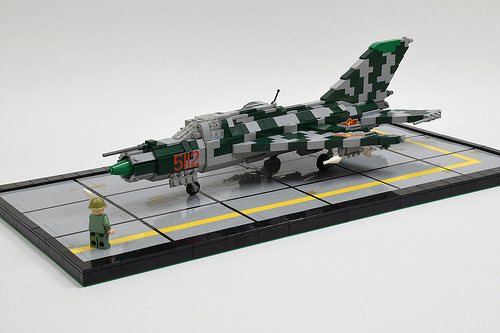 Both jets are part of a Vietnam collaboration by about a dozen builders, including yours truly, which will be on display at Brickfair Virginia in a little less than three weeks.